"It is difficult for me to write about Kashmir, for I have already written a large book on the subject, and just as one scorns to take ideas and advice from one's own family, so still less can I condescend to quote from "The Valley of Kashmir." But to live six splendid years in that valley, unspoiled by railways and roads, innocent of factories and coal, and long streets and concrete houses, sleeping in boats or in tents always pitched on green turf under the shade of plane or walnut trees, and always within sound of running, singing water that is a life to live over again. Such a climate, with the sun at its best ! The Capital is well named the City of the Sun, for summer or winter the sun smiles and sparkles in Kashmir. The air is no mere compound of gas, but a blend of dance and laughter, smiling even in drear December when the temperature is below zero: is blue, like the sapphires from Zanskar, but I never knew whether the blue came from the sky or from the rivers and lakes, or from the iris, which is the flower of the valley. And from each of the countless valleys which pass on the waters of the encircling snow range to the fabulous Hydaspes, there is the view of the naked majesty of Nanga Parbat, and the sheen of jagged Haramukh, which seemed to be always to the north. The Easterns have known the magic of Kashmir for centuries. The Moguls knew it, but Kashmir, like Corinth, was not approachable by everyone, and, though twice I have heard august consent given to the making of a railway, the tutelary divinities of this happy valley have intervened. Since I last saw Kashmir, roads have been made, and motor cars now run. But I doubt if even a railway could rob the valley of its strange and unique charm. I have said all I can say of its colour, its flowers and its fruits, and in the days when I first visited Kashmir, the only jarring note the censorious critic could hazard was that the people were Kashmiris." "I have given my testimony regarding the Kashmiris in "The Valley of Kashmir." It was the Fashion to say hard words of them, but none, English or Indian, who berated the Kashmiris, knew anything about the villages, and it was only fair that I should say what I could ; and six years continuous camping in the valley gave me opportunities for forming an opinion." This is the Kashmir that he saw. 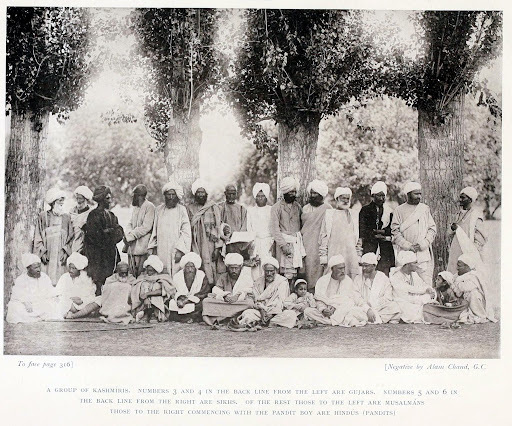 Photographs from the book 'Valley of Kashmir' (1895). These were taken by Major Hepburn, Captain Allan, Captain Godfrey and Alam Chand, the State photographer.